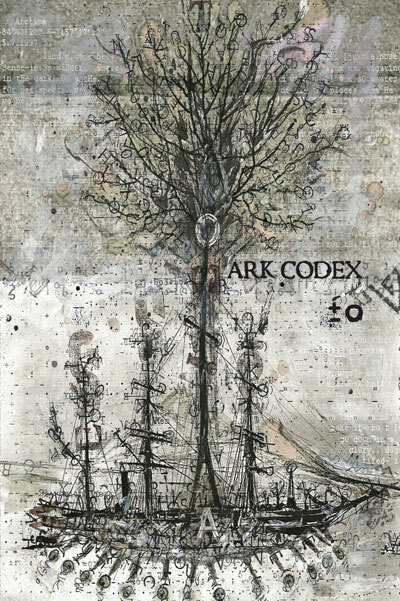 Ark Codex +/- 0 is a poetic collage narrative of just such an attempt, though it goes out of its way to disregard literary convention, as one might find it in the CMS. The authorless book—that is, no individual’s name is found anywhere on the binding or cover, and there is no title page or copyright page—represents an attempt by a fictional future scholar to decode collage texts left behind by a civilization restarting after the Anthropocene period, in which we now live. As Miami is currently being swallowed by rising tides, as catastrophic storms of every sort have become the norm, we see more and more writers contending with what will happen to civilization in the wake of climate change. We have seen the rise of documentary/activist eco-poetics, phenomenological eco-poetics, and we have seen many variations on elegiac, lyrical eco-poetics. Disaster poetics began with the advent of the atomic bomb, and the neurosis caused by the constant presence of potential annihilation lead to the publishing of many volumes of poems that imagine the effect of nuclear holocaust. Now that almost all evidence points toward a much slower, more inevitable cataclysm, it only makes sense that we wonder what will happen to intellectual culture in the aftermath. Ark Codex +/- 0 presents itself as a series of found documents, the captain’s log of a post-Anthropocene version of Noah’s ark. Each of its 154 glossy pages features a hi-res image of an earthy, muddled collage of language—some handwritten, some typed—painted imagery, and scraps of book pages, all obscured to varying degrees in the palimpsest. Below each collage is a prose translation of the image and language above. Each translation is roughly 100 words long, always on five fully justified lines, with consistent word spacing. The consistency of the printed text contrasts with the wild inconsistency of the language found in the collage, which is assembled to approximate English (with bits of French), but often strays from the use of the Roman English alphabet, utilizing in its stead various particles of Cyrillic, Greek, superscript, subscript, and French. However, these variations are relatively consistent, allowing the reader to quickly adapt to this idiosyncratic sign system. Reading this language actually requires the reader to perform a sort of translation, though the non-English language is itself, essentially, English. The process feels simultaneously alien and familiar, not unlike the popular cinematic depiction of post-apocalyptic landscapes, where familiar landmarks point out that this used to be New York, Los Angeles, London, etc. Similarly, the language in Ark Codex +/- 0 used to be English. The ark’s log seems to be a document of reconceiving language in a world that has been not just physically destroyed, but intellectually and culturally decimated as well. Just as the alphabetic frame of reference is wide and eccentric, the diction borrows from various fields. Mathematical language is combined with the language of genetic biology, biblical allusion, computer programming, and sea-faring. Likewise, the collages include pages from anatomical, botanical, cartographical, mathematical, musical, and dictionary texts. In these collages of we find evidence of an attempt to capture everything that is needed to begin again; hence the title Ark Codex. By insisting upon its own indeterminacy, Ark Codex +/- 0, can feel extremely obscure. The language is disjunctive, allusive, and punning. Much of the language in the collages is unreadable, and seems to only correspond in part to the translated text offered below. The source texts excerpted in the collages are not named. What lead to this apocalyptic state of the world is unclear. While there is a somewhat track-able narrative in the text regarding the building of the ark, the collection of species, and the navigation of the flooded landscape, what actually saves the book from coming across as a needlessly opaque is the seemingly endless rewards in viewing any single page. 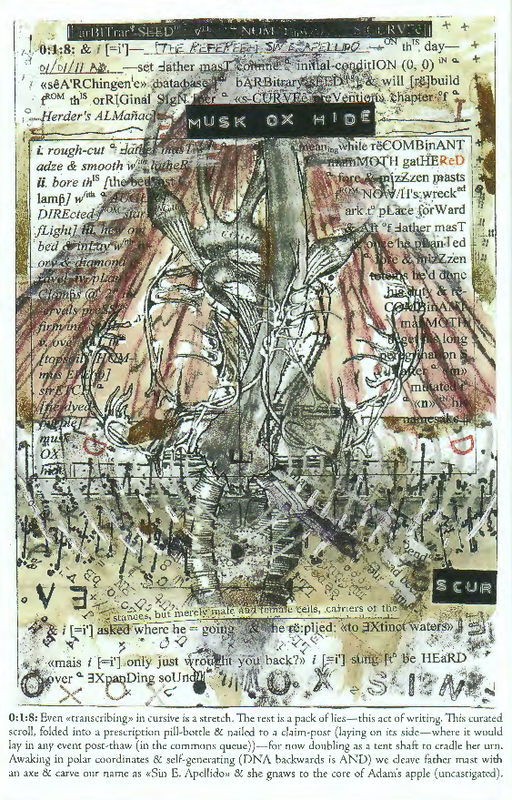 Each collage is so dense, and features so many different lingual and graphic forms of signifying—i.e. utilizing red text for emphasis as was done in the medieval manuscript era, thereby identifying itself with handmade, arcane practices—that the book seems increasingly meaningful the more time you spend with it, in spite of its indeterminacy. Michael Flatt is a PhD candidate in the Poetics program at SUNY Buffalo. He is the author of Absent Receiver (SpringGun Press, 2013) and with Derrick Mund,Chlorosis (Bon Aire Projects, forthcoming).